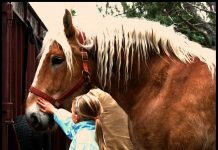 The Cowboy Mounted Shooting Association (CMSA) Tony Lama World Championship returns to the Tri-State Expo in Amarillo, Texas October 16-19, 2013. The four-day event pits the world’s best mounted shooting competitors against each other to vie for the World Championship title. The public is invited free of charge to watch the competition which starts Wednesday at 8:00 a.m. and continues 8:00 a.m. to 5:00 p.m. daily through Saturday. The highlights of the competition and perhaps of most interest to the public will be held on Friday evening and Saturday afternoon. The Friday Night Starline Showcase of Champions brings the world’s top ten professional competitors in each of the six divisions together to determine the CMSA’s best horse and rider, which includes the Cavalry Class finals, Taylor & Co. Rifle Class finals, Cimarron Shotgun Class finals and the Cimarron Eliminator finals. Saturday afternoon’s exciting event winds up the weeklong competition in the World Finals of cowboy mounted shooting, to decide who will take the coveted CMSA World Championship Title. Friday’s event starts at 7:00 p.m. Western vendors selling cowboy hats, boots, clothing and tack will be open daily from 8:00 a.m. to 5:00 p.m. and Friday night. 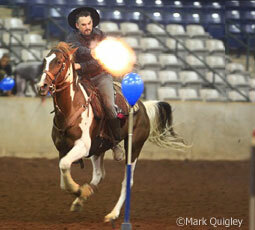 Cowboy Mounted Shooting is the fastest growing equestrian sports in the nation. The object of the sport is to shoot ten balloon targets while riding through a variety of challenging courses using specially loaded blank cartridges fired from Old West-style single-action revolvers. 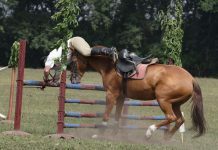 It’s a high-speed, timed spectator sport in which the competitor who rides the fastest with the least amount of missed targets wins. The CMSA’s Championship Series are held with the competitors riding as part of “Team Duke,” on behalf of the John Wayne Cancer Foundation, in order to raise awareness in their fight to cure cancer. The Cowboy Mounted Shooting Association is the governing organization of the sport and promulgates the rules and tracks the competitors of more than 100 affiliated clubs. Watch CMSA champion Kenda Lenseigne in the video below. The Tri-State Expo is located at 3301 East 10th Street, Amarillo, TX 79104. For more information call the Tri-State Expo at (806) 376-7767 or visit the CMSA web site at www.cowboymountedshooting.com. We have neighbors that do shooting. All the horses are solid bays, and they look so nice riding as a team. She’s more than excellent and that horse is pretty special too!